A swing point high (some traders call it a "pivot" high) consists of a high, a higher high, and then a lower high. A swing point low (or a "pivot" low) consists of a low, a lower low, and then a higher low. On the left side of the chart, you can see a swing point high. We would look to short this stock on the day of the third candle because it made a lower high and traded below the previous days low. In the middle of the chart, you can see a swing point low. We would look to buy this stock on the day of the third candle because it made a higher low and traded above the previous days high. 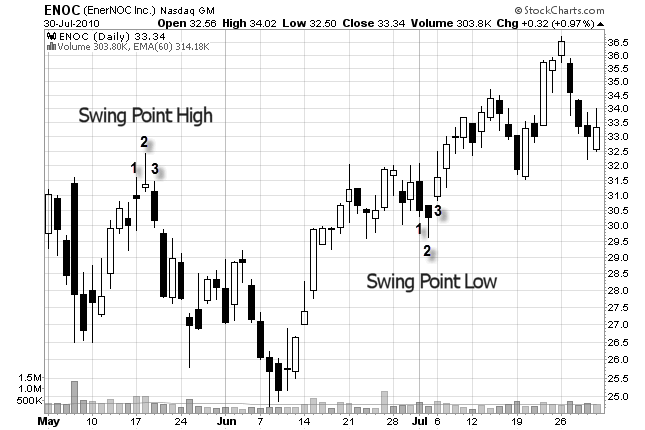 It is important to understand that not all swing points will result in a reversal. But many do. There are many more swing points on this chart. Can you find them? Ok, now let's look at an aggressive entry. An aggressive entry is an entry in which you buy or short a stock before it makes a swing point low or a swing point high. You are buying (or shorting) in anticipation of a swing point low or a swing point high developing. This is the same chart with another swing point low. Here you can see a low (1), a lower low (2) and then a higher low (3). Typically we would buy on the third candle (the higher low). But look at the second candle. It is a bullish engulfing candle and it traded over the previous days high. In this scenario, an aggressive entry would be to buy this stock on the second candle (2) in anticipation of a swing point low developing. 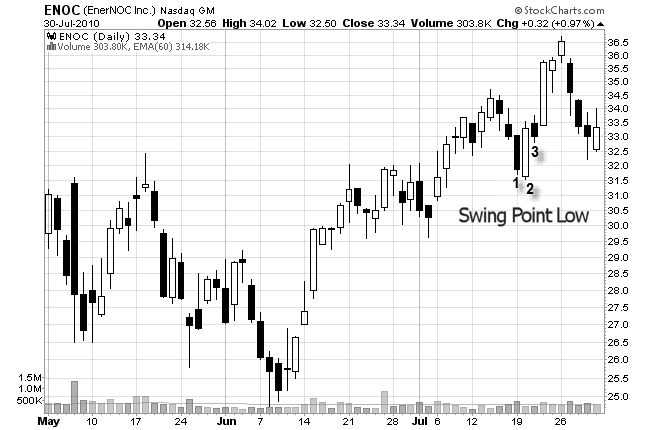 This stock has not made a swing point low yet. But, it does show a piercing candlestick pattern. So, you might want to buy this stock on the second candle in anticipation of a swing point low developing. Which entry strategy is better? One isn't really better than the other. It just boils down to risk versus reward. A standard entry is less risky because the stock has moved in your desired direction. But, often times, waiting for swing point to develop messes up your risk to reward because your stop is further away. 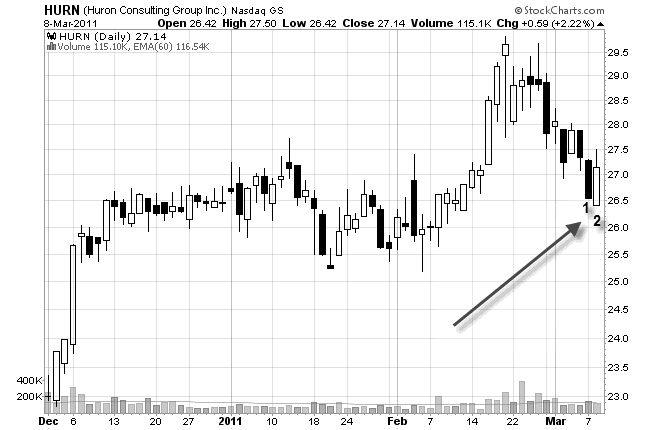 An aggressive entry is usually riskier because the stock hasn't reversed yet. But, your risk to reward is better because your stop is usually closer. Look at the chart above. For all I know, this stock could jump 10% on the next trading day! Then I probably wouldn't be able to trade this stock because my stop would have to be so far away. I usually opt for the aggressive entry if I can find a pattern suggesting a reversal on the hourly or 15 minute chart. And, if there is a hammer candlestick pattern, then I will buy on the day of the hammer instead of waiting to see if there is a higher low on the following day. Why are identifying swing points important? What happened on the fifth day? The bulls were able to push the stock to new highs on day one through four but on the fifth day they failed to do this. This means that the buyers are getting weak and the balance of power is shifting (from buyers to sellers). The above scenario formed a swing point high. The same thing happens when a stock forms a swing point low. What happened on day five? The bears were able to push the stock to new lows on day one through four but on the fifth day they failed to do this. The balance of power has shifted from sellers to buyers and a swing point low has developed. I hope all of this isn't too confusing. Just remember this: swing trading is a game - nothing more, nothing less. Your opponents are other swing traders! Everyone is trying to get into a stock before the other traders do. Get in too early and you will lose. Get in too late and you will lose. It's challenging but this is what makes the game so fun to play!